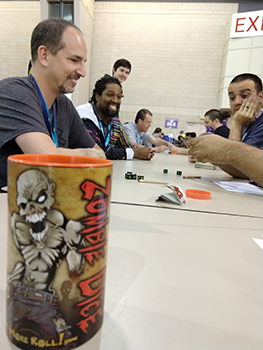 Daily Illuminator: Wrapping Up PAX U, BGG.Con, And More! November 20, 2017: Wrapping Up PAX U, BGG.Con, And More! The SJ Games staff has had a whirlwind of a weekend! 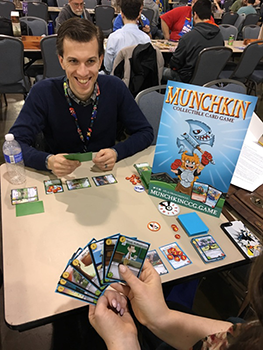 Not only did we attend two conventions (PAX Unplugged and BGG.con), but Phil was at ChiTAG, and demoed the Munchkin Collectible Card Game at local Chicago game stores! 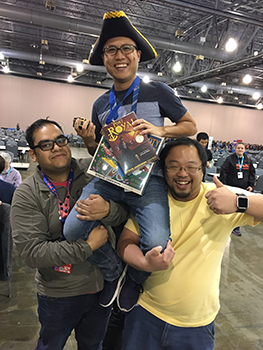 The inaugural PAX Unplugged took place in Philadelphia, and we had a plethora of huge events! 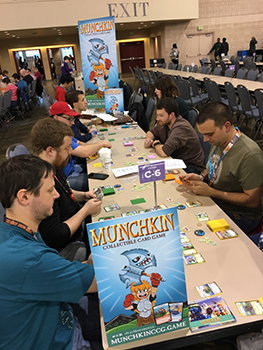 The Munchcathlon was packed with 64 players vying to be the top munchkin in the land, while the Zombie Dice tournament ended up with tons of brains being eaten. We crowned a new pirate king in Port Royal, and Munchkin Shakespeare took center stage for its own tournament! Command Posts fell during our Ogre Sixth Edition tournament. 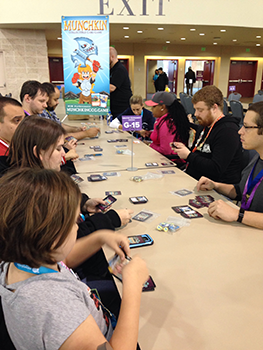 Plus, we had multiple, packed Munchkin Collectible Card Game events, like our Learn to Play and the mock draft on Sunday, not to mention round-the-clock demos taking place at the booth. We hope everyone who wanted to had a chance to check out the Munchkin CCG (and make sure you preorder the holiday special over on Warehouse 23!). 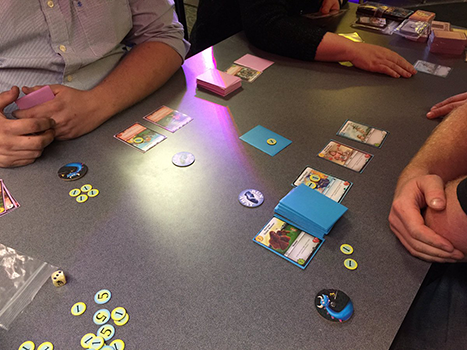 Fans of Triplanetary had the opportunity to demo the classic game ahead of the impending Kickstarter! 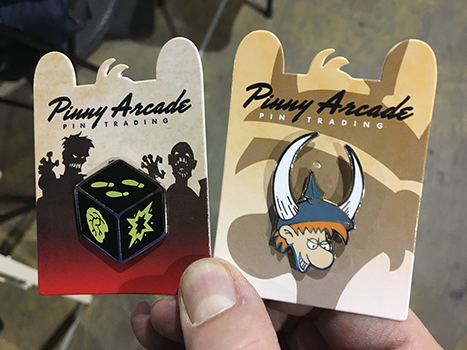 We even debuted our brand new Pinny Arcade collector pins, and I have to say, they are impressive! These collectible pins feature Spyke for Munchkin, and a Zombie Dice for, well, Zombie Dice. We sold a ton, but a little birdie told me that we may not have sold out, so keep an eye at future PAX events, and maybe even Warehouse 23. Our BGG.con crew held it down in Dallas with Super Kitty Bug Slap, which almost sold out of our advance copies! Folks were slapping tables left and right at the convention, and some lucky attendees even went home with free copies, thanks to the generous folks at BoardGameGeek, who added copies to a few of the prize bundles. 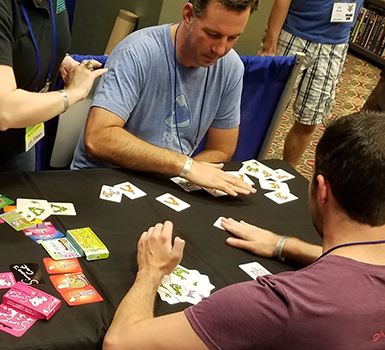 If you haven't been to BGG.con, you're missing out; it's five straight days of gaming, and is one of my personal favorite shows of the year. Check it out, if you have the chance next time! 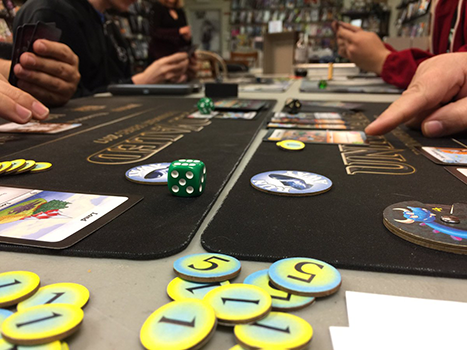 Of course, Phil gave our Chicago fans a personal tour of the Munchkin CCG with his demo nights at local game stores! A very special thanks to The Gaming Goat and Maximum Distractions, who hosted these awesome events. We're truly lucky to have some great local game stores ready to support the Munchkin CCG when it comes out next February. We had an absolute blast this weekend, and now we're happy to wind down for the holiday break. 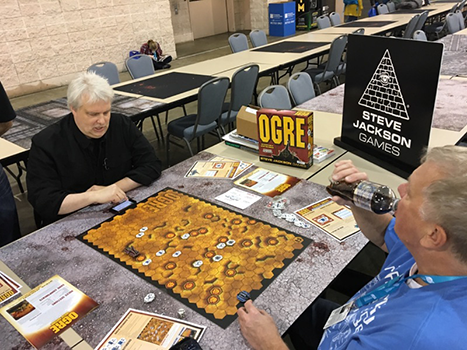 Oh, wait - we're running a Kickstarter for Ogre Miniatures Set 2! Guess it's back to the gaming grindstone. Well, let's get to it!